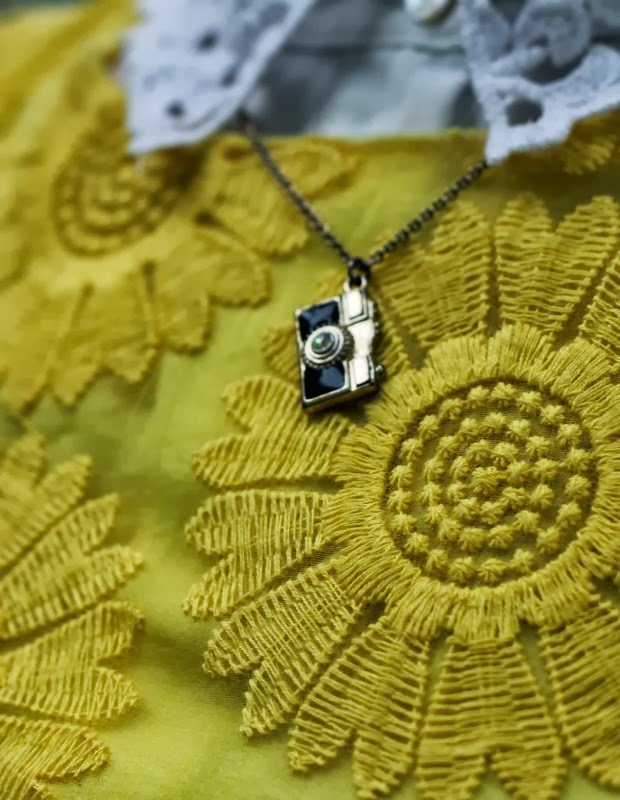 Laser Cut Blouse, Camera Necklace: Forever21. In the past year or so I've really noticed a decline in the interaction of the blogging community. Most of the blogs I followed/people I was first became 'blogging friends' with four years ago have abandoned their blogs. My reader is a graveyard of dead blogs or many blogs with seldom updates. It makes me so sad that these people I first connected with in the blogging community are no longer present. Makes me feel like an old woman watching all of her friends pass away. Just the regular blogger comment system is really hard to interact with though. There's no way for me to reply to or respond to the comments you all leave me. I've considered getting something like disqus or what not, but I'm not sure if it would even matter. I mean, do people come back and check to see if a blogger responds? These are just some things I've been thinking about lately and I know a lot of other bloggers have been, too. Both Maggie and Kaelah put it excellently. No matter whether I have 0 comments, no one reading my blog, or whatever happens to blogging in the future(with this new downward trend you never know)...I hope to always continue. As long as you're happy with your blog and enjoy doing it, the comments and followers and all that jazz are just an added bonus. I mean, yes it's nice and I surely need to do more commenting and lifting my fellow bloggers up (that's what makes the community so awesome! ), but it shouldn't define the success or failure of your blog. Thank you for this post, it reminds me of what you were telling me a few weeks ago and makes me feel better about not having many followers or views! As long as you enjoy blogging, nothing else matters! I always make sure that I check back on any post that I've commented on to see if a blogger has replied but if they're a bigger blogger (such as yourself), I understand why they don't reply back as there are usually tones of comments for them to sift through on each post! Hey! Good point! Most of those who I blogged with eight years ago have now stopped or barely do it! I don't know if the rise of the mobile phone has anything to do with the lack of commenting or less, because when I was reliant on my phone last month, it sure was a right point formulating a comment, making sure it actually sent, typing one finger at a time! Here on my computer, I can just blab, really quickly, but it is harder on a phone. I was always really religious on commenting on blogs that I loved (like yours) but in recent times, I have had frustrations with my computer (so slow) and less time to actually do it, so I apologise if my commenting is less than it has been! I hope to get back a bit more into it! Agreed, blogging doesn't feel as interactive anymore but I still enjoy it. Now I consider it lucky if I can get at least 10 comments on a post! Back then it was a lot more. Makes me wonder if many people have just left the blogosphere. Who knows! I always notice a decline in comments on my blog when I've been too busy to catch up with the blogs I normally read and comment on. I always catch up eventually but it can take me weeks with grad school work bogging me down. I think the more interaction we each put out there, the more returns to us. No matter the changing blogging landscape that will always be the case. Interaction feeds interaction. But I digress. I love love this outfit. This yellow dress is the cutest yellow dress in all the land! I love the blouse you layered underneath it. Your hair also looks super pretty styled like this. Classic and gorgeous, as always! I love Disqus for leaving comments-- one less thing to log into, and it lets you know when people reply to your comments! But there has been a decline in blog interaction with Facebook and twitter and instagrm getting so much more attention! Love this outfit! You're so gorgeous! This is so true. I stopped updating my blog a long time ago because I just got burnt out on it, and I stopped reading/commenting on other blogs. I do still follow my favourite bloggers on Instagram and read their posts every once in awhile though. It's nice to still feel connected to the blogging world on Instagram and Twitter, even when I have no time for the real thing. Keep it up though! Your blog is awesome and so are your IG pics! Lauren, I totally agree with everything you wrote in this post! I admit, I haven't been commenting as much as I would like to on other blogs, and this makes me sad. The whole reason I fell in love with blogging when I started my first (quite embarrassing) blog four years ago, was the community atmosphere, and it is devastating to think that the blogosphere has lost a bit of this charm. But I doubt I could ever stop writing and blogging (despite how infrequently I do it) because above all else I do it for myself, and I enjoy it immensely. Pondering aside, you look gorgeous as always! Yellow suits you so well. Love how you made this dress fall appropriate with the pretty top underneath! And I agree, a blog should be for YOU, not for followers! I too have noticed an overall drop in commenting on blogs - it's very sad! I really hope blogging isn't going anywhere any time soon because I feel like it is such an incredible medium. Beautiful outfit, Lauren! I love your hair! I love your outfit, I want that blouse! This outfit is one of my favorites of yours!! 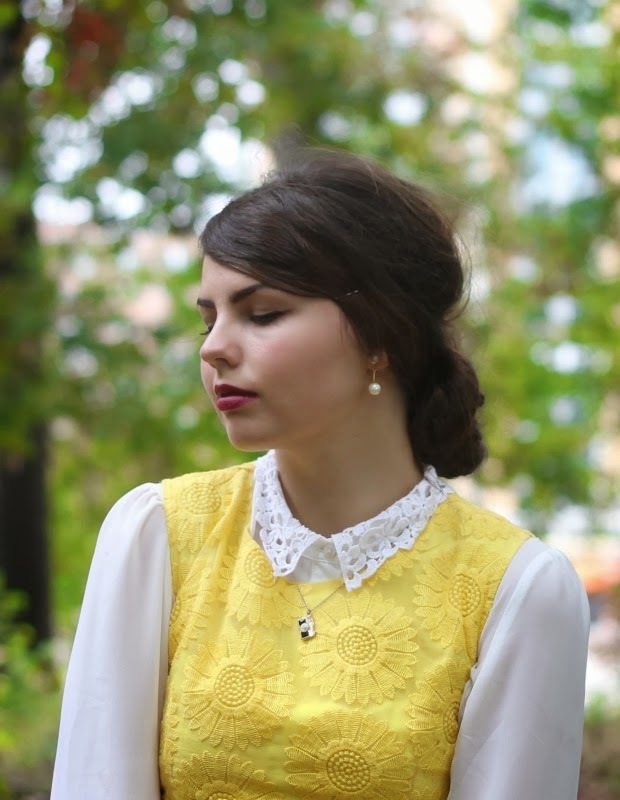 The blouse underneath this sunny dress is impeccable, and I love how you did your hair here! I think interacting with other bloggers has been one of my favorite parts of blogging -- not getting comments, but just making genuine connections and carving out a little corner in the blogosphere. I know that people get busy and can't comment all the time (I'm guilty of this, too). It's a great way to show that you care about someone else's little corner of the blogosphere, though. Ultimately, I'd still be blogging just for myself, even if no one else cared. But I'm glad to know there are people who do. 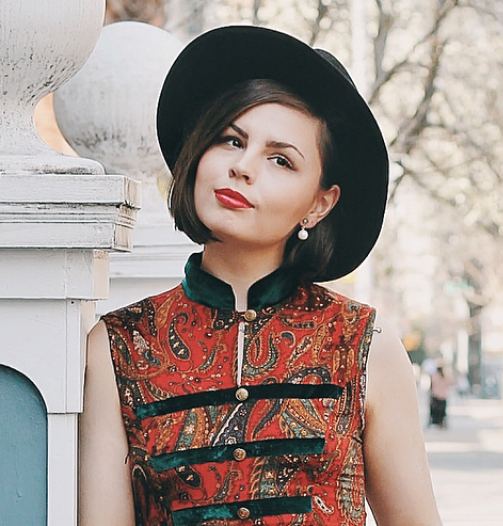 I just found you through the Fashion and Faith link up and I love your blog! You are so right! I just started blogging in January, but I think the blogosphere is saturated with folks who hopped on a "trend" and did not take blogging as seriously as some of us do! I'm always looking to connect with bloggers on a more meaningful level.